Interchangeable Sterling Silver Hammered Oval link bracelet with two sterling clasps - No Tag. Light weight sterling silver chain is the perfect bracelet for day or evening. 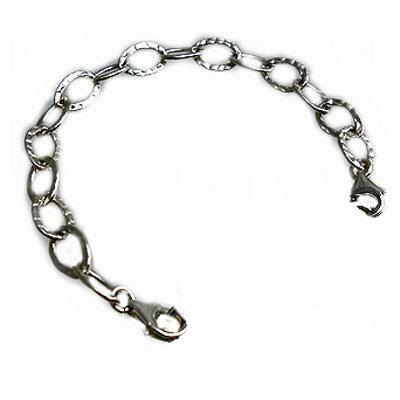 Chain links are approx 10x7mm There is no further discount on this product. Creative Medical ID Strands: All beaded�Creative Medical ID strand come with a�90-day guarantee, and orders arrive at your door with a Free Medical Emergency Wallet Card and complimentary�Organza Jewelry pouch. Thanks for shopping with us.